A powerful, beautifully written historic novel of loss, finding and being found, set in a very traumatic period in Europe. The turbulent sixteenth century saw the disintegration of medieval Christendom as it was split into sovereign states. This was particularly destructive in Tudor England where rapid switches in government policy and religious persecution shattered the lives of many. Especially affected were the monks and nuns who were persecuted by the wholesale dissolution of the monasteries carried out under Henry VIII. One of these monks, Robert Fletcher, a Carthusian of the dismantled priory of Mount Grace in Yorkshire, is the hero of this novel. The story of this strong, vulnerable man is told in counterpoint with the story of one of the most interesting men in all of English history, Reginald Pole, a nobleman, scholar and theologian who was exiled to Italy for twenty years. He was a Cardinal of the Church, papal legate at the Council of Trent, and as Archbishop of Canterbury, with his cousin Queen Mary Tudor, they tried, in too short a time, to renew Catholic England. This man, in the tragic last months of his life, becomes in the novel the friend of Robert Fletcher, condemned as a heretic. Readers will learn much from this novel of the anguished period which gave birth to Tridentine Catholicism as well as to the Anglican and other Protestant churches, and which martyred Carthusian monks as well as Thomas More, John Fisher, Thomas Cranmer and many others. The profound issues raised in this novel, which contains no altered historical facts but more human truth than facts alone can deliver, have not gone away. With the 500th anniversary of the Protestant Reformation in 2017, there will be wide interest in these issues. “This great novel places us in the turbulent time of the English Reformation where we experience the common trauma of the day, and then, as in all excellent historical fiction, we ask ourselves, ‘Where does my choice lie?’ Seldom has this challenge been given so well. Beckett is a very gifted writer." Along with recent films ParaNorman and Boxtrolls, the Laika studio has a notable track record of promoting New Age progressive spiritual values—and Kubo reaches a new low point. In The Usual Suspects, Roger Kint stated that “the greatest trick the Devil ever played was convincing the world he didn’t exist.” That may have been true in the 20th century, when fascism and communism terrorized the world, but now the Devil has shifted his strategy. In the 21st century, his trick is getting people to believe that Jesus Christ promotes his agenda. Kubo and the Two Strings, the new and widely praised film from the Laika animation studio, is such a trap. Keep kids far, far away. Snatching a trope from Disney, the story starts as the baby Kubo (Art Parkinson) is rescued by his goddess Mother (Charlize Theron), but not before his grandfather, the Moon King, kills his human father and rips out his left eye. They spend the next twelve years in a cave hiding, with Kubo earning money on the streets of rural Japan by telling stories with his shamisen. “Never go out after sunset,” Mother tells him, “or my sisters will find you and take your other eye.” Kubo is not only a great storyteller but also the possessor of special powers because of divine blood. As he plays the shamisen, origami figures come to life and dramatize his stories. While he has the admiration of the townspeople, his life is still a mystery. Injured in the rescue, his mother suffers from an unknown mental disorder, and it’s hard to discern whether her tales are true. As he learns more about his past the tables are upset again and again, culminating in a hero’s quest to find his father’s armor and confront his grandfather. The spirituality starts out simple as well but becomes more complex before revealing its sinister nature in the third act. Continue reading on The Dispatch. While avant-garde art dominated the past century, notes Robert R. Reilly, glorious and melodic music was being written all along, even if often suppressed or neglected. Robert R. Reilly has written about classical music for more than 35 years, including for Crisis magazine, where he was music critic for 16 years. He has also written about music for High Fidelity, Musical America, Schwann/Opus, and the American Record Guide. He is the director of The Westminster Institute, which was established in 2009 to "promote individual dignity and freedom for people throughout the world by sponsoring high-quality research, with a particular focus on the threats from extremism and radical ideologies." During a quarter century of government service, Reilly worked in the Office of the Secretary of Defense, in the White House under President Ronald Reagan, and in the U. S. Information Agency; he was also the director of Voice of America. In addition to his writings about music, he has written widely on foreign policy, "war of ideas" issues, Islam, and culture. He recently corresponded with Catholic World Report about a new and expanded edition, published by Ignatius Press, of his book Surprised by Beauty: A Listener's Guide to the Recovery of Modern Music. CWR: You have been in the military, served in the White House under President Reagan, and were director of Voice of America. How did you become a music critic? And how, in particular, did you become interested in modern classical music? How did you end up writing music reviews for Crisis magazine? Robert R. Reilly: Well, I was thunderstruck by music when I heard, quite by accident, Jan Sibelius’s Fifth Symphony. By the time the recording was over, I was a changed person. I was 19 years old at the time; my music quest began. I plunged in in search of the experience and for an explanation as to why I had had it. What was it about? French poet René Char wrote that the “grace of the stars resides in their compelling us to speak.” This music compelled me to speak. So, some 15 years later, after I gained the right vocabulary and enough experience, I began writing about it and the other treasures I had discovered. As you pointed out, this was not my day job. My day job was fighting the Evil Empire. So, as an avocation, I wrote for a number of musical journals like High Fidelity and Musical America. Then Deal Hudson, whom I did not know at the time, moved to Washington, DC, to take over Crisis magazine. He came to my house and, out of the blue, asked me to contribute a monthly article about classical music. He is one of those rare conservatives who are culturally literate in every sphere, including classical music, about which he is equally enthused. I did that for 16 years. It was Deal who suggested that we publish a book of my essays. It turned out that most of what I had written was about 20th century music. That had not occurred by any design of mine or his. That book, the first edition of Surprised by Beauty, came out in 2002, with Deal as the publisher. Lo and behold, some 14 years later, now the second edition of the book is out—this time from Ignatius Press. It is more than twice as long as the original and completely revised. There is so much more good news about the recovery of modern music in this listening guide. I hope readers will be enticed to explore some of the many CD recommendations in it. I emphasize that this is not a book with technical jargon written for music specialists. It is for the general reader who has an open mind, an open heart, and who opens his ears. CWR: The terms "modern music" and "modern classical music" are usually not met positively by those who hold to more traditional beliefs about the arts, culture, and religion. Is it the case, however, that stereotypes and assumptions have obscured necessary distinctions between various composers, movements, and schools of music? Reilly: Modern art strove hard to earn its bad reputation. It succeeded. People fled the concert halls because they did not want to hear what sounded like a catastrophe in a boiler factory. Likewise, many people shunned modern painting when canvases looked like someone had spilled a plate of spaghetti. Modern architecture seemed to be a contest as to who could design a building that best disguised the fact that human beings would be in it. Unfortunately, the avant-garde gained control over the levers of the art world—by which I mean the commissions, the prizes, the positions in academe, the cultural press, etc. Unless you played ball with the avant-garde, your artistic goose was cooked. This was not true for some of the giants who continued to write in the traditional tonal manner, but it was decidedly true for the up-and-coming younger composers from the mid-20th century until about 20 years ago. They suffered a lot. The whole point of my book is to announce that it is safe to come out of the bomb shelters now. Not only is beautiful music being written again but, it turns out, beautiful music was written all along, throughout the 20th century. It simply went underground. Some of it was suppressed (literally the case in some Communist regimes), some of it was simply neglected, but it is surfacing once again. And it is glorious. These are the composers I write about in this book, along with the recommended recordings of their works. They are the other 20th century about which most people have never heard – though there are a number of composers, like Samuel Barber, Benjamin Britten, and Ralph Vaughan Williams, whom they probably have heard of, who are in the book. Of course, I also include contemporary composers. The tremendously good news is that we are living at the time of a major musical renaissance. CWR: In the Introduction, "Is Music Sacred? ", you explain how destructive musical revolution of the 1920s, directed by Schoenberg and others, rejected tonality and melody. What were some of the deeper reasons for this revolution? In what way that revolution relate to the cultural upheavals in Western societies? Reilly: Yes, there were deeper reasons that were ultimately metaphysical and spiritual. Music, art and architecture reflected a wholesale rejection of form, which is another way of saying Nature. I recall one artist saying, “If I don’t do anything else in my artistic life, I want to smash form” – which expresses, shall we say, a certain resentment of reality. Going back to Pythagoras, the traditional understanding of music held that it was somehow an approximation of “the music of the spheres.” In fact, Pythagoras thought that music was the ordering principle of the world. The whole point of approximating the heavenly harmony was to instill inner harmony in the soul. Following Pythagoras, Plato taught that “rhythm and harmony find their way into the inward places of the soul, on which they mightily fasten, imparting grace, and making the soul of him who is rightly educated graceful”. This idea of “the music of the spheres” runs through the history of Western civilization with an extraordinary consistency, even up to the 20th century. At first, it was meant literally; later, poetically. Read the entire interview at www.CatholicWorldReport.com. A painting of one of Michael Collopy’s photographs in his book Works of Love Are Works of Peace has been chosen to be the official Sainthood image of Mother Teresa. The image will be revealed at the canonization and then it will be in the homes of the Missionaries of Charity worldwide. Another one of Collopy’s photographs from Works of Love Are Works of Peace is being used for both the official Vatican Saint Teresa stamp, as well as for the recent cover of Time magazine. Michael Collopy is available for interviews about his experiences photographing Mother Teresa, both now and during his upcoming trip to Rome for the canonization on September 4. Works of Love Are Works of Peace, now available in paperback, was more than four years in the making and published with the cooperation of Mother Teresa. This large format 224 page book offers the most comprehensive photographic documentation of the apostolic work and prayer life of the Missionaries of Charity published. Destined to serve as an important historical record, this “illustrated prayer book” vividly portrays the peace and joy that can come when “small things” are done with great love. The more than 180 fine art quality tri-tone The stamp to mark the canonisation of Blessed Teresa of Calcutta photographs, along with spiritual counsel from Mother Teresa, will provide a lifetime of rich material for prayer and meditation. Also included with Mother Teresa’s special permission, is the contents of the Missionaries of Charity daily prayer book as well as a most personal and profound letter on the interior life written by Mother Teresa to her entire order. Though meant originally as an instruction to those in her order, this “I Thirst” letter has become a source of spiritual light and encouragement, drawing innumerable hearts and souls closer to God. “This exceptionally well-produced photo-documentary chronicles the work of Mother Teresa and the order she founded. Avoiding sentimentality, the photographs show the love of Christ in action,” says Christianity Today. Works of Love are Works of Peace is “quietly eloquent,” says the San Francisco Examiner. Michael Collopy is one of the preeminent portrait photographers of our time, well known for his commissioned portraits of a variety of world figures ranging from Mikhail Gorbachev and Margaret Thatcher to Frank Sinatra and Placido Domingo. A student of such luminaries as Ansel Adams and Richard Avedon, Collopy’s work has been published in books, magazines, newspapers, and on record and CD covers worldwide. Argentina is trying to break with 70 years of populism, corruption, and general economic decline. But in the age of the Argentine pope, what role will the Church play in this process? Before Jorge Bergoglio’s election as the first Latin American pope in 2013, Argentina was famous for many things: tango, its magnificent pampas, the beautiful late-nineteenth century architecture that marks much of Buenos Aires, to name just a few. Unfortunately, other things also come to mind: rampant and persistent corruption, extreme political instability, and, above all, the fact that Argentina is the twentieth century’s textbook-case of largely self-inflicted economic decline. Consider that as late as 1940, Argentina was the economic equal of Australia and Canada. Since then it’s been generally downhill. During a recent trip to Argentina, however, I was immediately struck by the optimism that marked Argentines themselves. This contrasted with the widespread gloom visibly characterizing the country that I’d noticed on previous visits. One reason for the difference is that Argentina elected a non-Perónist to the presidency in November 2015, thus terminating 13 years of rule by the late Néstor Kirchner and his wife Cristina. They belonged to the wave of Latin American leftist-populists who came to power from the late-1990s onwards and who brought political and economic disarray in their wake. Since assuming office, Argentina’s new President, Mauricio Macri, has sought to take the country in very different directions. He ended Argentina’s backing of the Chávista regime that has all but destroyed Venezuela. Macri is also exposing deep-seated corruption, the most notorious case thus far being a former Kirchner government official caught hiding several million US dollars in a convent. This has been accompanied by an effort to detoxify public discourse of the demagogic rhetoric that’s long plagued Argentine politics. Economically, Macri has started, albeit cautiously, moving Argentina away from its closed, highly-statist economic arrangements. This has included abolishing currency and capital controls as well as eliminating some price-controls, particular export taxes, and specific subsidies. Thus far, opinion polls suggest that a slim but wavering majority of Argentines support Macri’s reforms. As one Jesuit remarked to me, many Argentines view Macri as the nation’s last chance to reverse the trend towards permanent decline. Judging, however, from the anti-Macri posters and demonstrations throughout Buenos Aires, plenty of Argentines oppose the reforms. Perónist politicians, long accustomed to using public office to dispense favors to supporters, aren’t going quietly. Likewise, Argentina’s powerful trade unions have said they’ll resist changes to the country’s heavily-regulated labor markets which, like all such markets, effectively discourage businesses from hiring people. Another question occupying many Argentines’ minds is the stance of another important institution in the country’s life. Is the Catholic Church going to help smooth the path away from populism? Or will it, in the name of defending the poor, encourage resistance to reform? In all such discussions, Pope Francis’s words and actions feature prominently. Does the Church’s liturgy enable, now, the expression and communication of sacred realities? Is the ‘sacred’ still a meaningful category? Among the signal events to mark the Church’s life in 2015 was the 500th birthday of St Teresa of Jesus. The year’s peak event, her feast on 15 October, was overshadowed by headlines from the Synod; yet this year has been nonetheless a Teresian year, calling to mind the Castilian Doctor’s formidable legacy. I found myself gently haunted by Teresa while reading Fr Uwe Michael Lang’s Signs of The Holy One . I should like, with her help, to reflect on questions raised by the book. For this is a volume that interrogates. It formulates problems not susceptible of easy resolution. There is material here for an examen of consciousness. I invoke the term ‘consciousness’ advisedly. Although Fr Lang mainly addresses issues of liturgical praxis, he knows better than just to bemoan the transgression of rubrics. He points towards a breakdown of sense in liturgy. He shows how this breakdown ominously points to senselessness likewise in life and belief. It is tempting to imagine his subtitle ending with a question mark: ‘Liturgy, Ritual, and Expression of the Sacred?’ Does the Church’s liturgy enable, now, the expression and communication of sacred realities? Is the ‘sacred’ still a meaningful category? The book’s first part expounds the sense-content of ‘sacredness’ as defined by modern anthropology and theology. The sheer variety of approaches bewilders. This is brought out in the second part, which indicates wrong turns taken in sacred architecture, music, and art over the past half-century. They happened because the signifier ‘sacred’ was often put, as it were, on its head. Hijacked by human criteria, it could no longer effectively point upward and out to the transcendent. The crisis of sacred liturgy and art is thus a crisis of purpose, of finality. By way of illustration, Fr Lang cites examples apt to make the reader smile. Really, though, there is cause for sadness. When the proclamatory impact of Christian devotion is compromised; when the aesthetic response to faith becomes purely subjective, cut off from a sharable paradigm; when ritual seems little more than fortuitously repeated action: then woe is us, for the Gospel is not preached with the force it requires and deserves. What can we do? How can we respond? We might turn for counsel to the half-millenarian, plain-speaking Doctor of Ávila. Teresa is a witness to the beautiful dimension of faith. When she speaks of it, she is categorical: ‘The fact of seeing Christ left an impression of his exceeding beauty etched on my soul to this day: once was enough’ (xxxvii.4). This beauty is disturbing, even dangerous. New from Ignatius Press: E-book of "Ben Hur: A Tale of the Christ"
Ben-Hur is the classic, best-selling book behind the many famous film versions. The author, Lew Wallace, created a literary biblical epic in this exciting and inspirational story of friendship betrayed, revenge, and, ultimately forgiveness and redemption. Subtitled "A Tale of the Christ", Ben-Hur is the story of the fictional main character's life encounter Jesus of Nazareth. Wrongly condemned for attempted assasination and sedition, the Jewish prince Judah Ben-Hur is betrayed by his erstwhile childhood Roman friend, Messala, and is sentenced to the galleys while his family is cruely imprisoned. A providential turn of events brings Ben-Hur to a fierce chariot race with Messala and, ultimately, back to Jerusalem, during the ministry of Jesus. Ben-Hur's faith in Jesus as the Messiah is challenged by his crucifixion at the hands of both the Romans and Jewish authorities. But neither Ben-Hur's story nor Jesus' story ends there. Paramount Pictures and Metro-Goldwyn-Mayer Pictures will release its remake of Ben-Hur on Friday, August 19. The movie is a retelling of the 1880 novel by retired Civil War Union General Lew Wallace, and it follows Jewish prince Judah Ben-Hur (played by Jack Huston) as he is betrayed into slavery by his friend, Roman officer Messala (Toby Kebbell). The film is set in and around Jerusalem 2,000 years ago, and Judah encounters Christ at key moments in his life. The best-known presentation of Ben-Hur is the 1959 version starring Charlton Heston, which received 11 Academy Awards, including Best Picture. The 2016 version follows the same general story line, with some significant differences. The modern version has a distinctly more Christian message, and unlike the 1959 version, Christ has a larger, speaking role. That this version is more clearly religious is no doubt due to the influence of executive producers and husband-wife team Mark Burnett and Roma Downey, known for their productions The Bible, A.D.: The Bible Continues, and Son of God. They describe themselves as “the noisiest Christians in Hollywood,” and admit that the new Ben-Hurengages in stealth evangelism, presenting Christ’s message of “love and forgiveness” to viewers who ordinarily would never darken the door of a church. The story opens depicting the close, adoptive-brother relationship between Judah Ben-Hur and Messala. In the opening scene the pair are racing horses for sport in the countryside, and Judah is thrown from his horse and injured. Messala leaps from his horse to care for his fallen friend, and ends up carrying him back to the city. During Judah’s recovery we learn that the house of Ben-Hur is a royal Jewish home, while Messala worships pagan gods. Seeking adventure, Messala leaves Jerusalem to join the Roman army. He distinguishes himself as a soldier as he battles the Empire’s foes. He returns to Jerusalem three years later, and is happily welcomed home by Judah and his friend’s mother and sister. Messala is in love with Judah’s sister, which contributes to the animosity between Messala and Judah when their relationship sours. Judah, meanwhile, enjoys the good life as a prince. In the new version of Ben-Hur, Judah’s wife Esther (portrayed by Iranian-born actress Nazanin Boniadi) has a larger role than in the 1959 film. Early on in the movie the pair first meet Christ while shopping in the marketplace. Judah is a pacifist, wanting nothing to do with the Jewish Zealots trying to overthrow Roman rule, but is clearly no fan of Roman brutality. Christ, while engaging in carpentry in the public square, introduces a novel concept to the pair: “Love your enemies.” It is an idea that Judah initially finds absurd. When Messala returns to Jerusalem after three years of warfare, he is a respected Roman officer. He tells Judah that Pontius Pilate, the new Roman governor, will be coming into the city and requests his help in identifying and arresting the Zealots among the people. Judah, who secretly—albeit reluctantly—helped an injured Zealot named Dismas, refuses. Dismas—the “Good Thief” on the cross alongside Christ—attempts to murder Pilate as he enters the city. Judah and his family are arrested, and the relationship between Judah and Messala is severed. Judah is sent to be a galley slave, chained to his seat and manning an oar, and his mother and sister are imprisoned. The second part of the film includes its two great action sequences. A cave Jeremias found there, in which he set down tabernacle and ark and incense-altar, and stopped up the entrance behind him. There were some that followed; no time they lost in coming up to mark the spot, but find it they could not.—2 Machabees 2:5-6. After this, God's heavenly temple was thrown open, and the ark of the covenant was plain to view, standing in his temple.—Apocalypse 11:19. The Son of God came to earth to turn our hearts away from earth, Godwards. The material world in which we live was, by his way of it, something immaterial; it didn't matter. We were not to be always worrying about our clothes being shabby, or wondering where our next meal was to come from; the God who fed the sparrows and clothed the lilies would see to all that. We were not to resent the injuries done to us by our neighbours; the aggressor was welcome to have a slap at the other cheek, and when he took away our greatcoat he was to find that we had left our coat inside it. Life itself, the life we know, was a thing of little value; it was a cheap bargain, if we lost life here to attaIn the life hereafter. There was a supernatural world, interpenetrating, at a higher level, the world of our experience; it has its own laws, the only rule we were to live by, its own prizes, which alone were worth the winning. All that he tried to teach us; and we, intent on our own petty squabbles, our sordid struggle for existence, cold-shouldered him at first, and then silenced his protest with a cross. His answer was to rise from the dead; and then, for forty days in the world's history, that supernatural life which he had preached to us flourished and functioned under the conditions of earth. A privileged few saw, with mortal eyes, the comings and goings of immortality, touched with their hands the impalpable. For forty days; then, as if earth were too frail a vessel to contain the mystery, the tension was suddenly relaxed. He vanished behind a cloud; the door of the supernatural shut behind him, and we were left to the contemplation of this material world, drab and barren as ever. What was the first thing the apostles saw when they returned from the mount of the Ascension to the upper room? "Together with Mary"—is it only an accident that the Mother of God is mentioned just here, by name, and nowhere else outside the gospels? The Incarnate Word had left us, as silently as he came to us, leaving no trace behind him of his passage through time. No trace? At least, in the person of his blessed Mother, he had bequeathed to us a keepsake, a memory. She was bone of his bone, flesh of his flesh, the new Eve of the new Adam. That body of hers, still part of the material order of things, had housed and suckled God. As long as she lived, there would still be a link, a golden link, between this lower earth and Paradise. As long as she lived; and even if it was God's will that she, Eve's daughter, should undergo the death that was Eve's penalty, the penalty she had never incurred, her mortal remains would still be left with us, an echo from the past, an influence on our lives. We men, since we are body and soul, do honour even to the lifeless bodies which have housed the dead; Napoleon rests in the Invalides, Lenin at Moscow. The day would come when there would be pilgrimages from all over the world to the shrines of Peter and Paul at Rome, of James at Compostela. Was it not reasonable to hope that somewhere, at Jerusalem, perhaps, or at Ephesus, we should be privileged to venerate the mortal remains of her through whom salvation came to us? Or perhaps at Bethlehem, Bethlehem-Ephrata, this new Ark of God would rest, as the ark rested of old; "And now, at Ephrata, we have heard tidings of what we looked for"  —the old tag from the Psalms should still ring true. God disposed otherwise. Jewish tradition recorded that when Jerusalem was destroyed by the armies of Babylon, the prophet Jeremias took the ark of God away from the city, and buried it in some secret cleft of the rock; it was never seen again. Never again, except by St John, in his vision on the isle of Patmos; he saw the ark of God, but in heaven. And so it was with this new Ark of God, the virgin body that had been his resting-place. When and where she passed away from this earth, or in what manner, nobody can tell us for certain. But we know where she is. When Elias was carried up into heaven, the sons of the prophets at Jericho asked Eliseus if they might go out in search of him; "it may be", they said, "the spirit of the Lord has carried him off and left him on some hill-top or in some cleft of the valleys." He consented grudgingly, and when they returned from their fruitless errand, greeted them with the words; "Did I not tell you not to send?" So it is with the body of the blessed Virgin: nowhere in Christendom will you hear the rumour of it. So many churches, all over the world, eagerly claiming to possess the relics of this or that saint; who shall tell us whether John the Baptist sleeps at Amiens, or at Rome? But never of our Lady; and if any of us still hoped to find that inestimable treasure, the Holy Father has called off the search, only the other day. We know where her body is; it is in heaven. Of course, we knew it all along. For myself, I have never doubted the doctrine of the Assumption since I heard it preached forty-four years ago, in an Anglican church over at Plymouth. You see, we get it all wrong about body and soul, simply because our minds are dominated by matter. We think it the most natural thing in the world that soul and body should be separated after death; that the body should remain on earth and the soul go to heaven, once it is purged and assoiled. But it isn't a natural thing at all; soul and body were made for one another, and the temporary divorce between them is something out of the way, something extraordinary, occasioned by the Fall. In our blessed Lady, not born under the star of that defeat, human nature was perfectly integrated; body and soul belonged to one another, as one day, please God, yours and mine will. Long ago, in those fields of Bethlehem, Ruth had gleaned in the footsteps of her beloved; and he, secretly, had given charge to the reapers to drop handfuls of corn on purpose, so that she might fill her bosom the sooner. So he, whose reapers are the angels, would leave for his blessed Mother a special portion of those graces that were to enrich mankind. The child-bearing which brought, to us others, redemption from the fault of our first parents should bring, to her, exemption; the empty tomb, which assures us that our bodies will rise at the judgment, was for her the earnest of an immediate resurrection; Christ the first-fruits, and who should glean them, but she? For that, heaven is the richer, earth the poorer. We can go to Lourdes, and offer adoration in the place where her feet stood; we cannot press with our lips some precious reliquary containing the hand that swaddled Christ. In a world so dominated by matter, in which matter itself seems to carry the seeds of its own destruction, there is no material object left that can link our destinies with hers. And yet, is the loss all loss? When the dogma of the Assumption was defined a friend of mine, a very intelligent Mohammedan, congratulated me on the gesture which the Holy Father had made; a gesture (said he) against materialism. And I think he was right. When our Lord took his blessed Mother, soul and body, into heaven, he did honour to the poor clay of which our human bodies are fashioned. It was the first step towards reconciling all things in heaven and earth to his eternal Father, towards making all things new. "The whole of nature", St Paul tells us, "groans in a common travail all the while. And not only do we see that, but we ourselves do the same; we ourselves although we have already begun to reap our spiritual harvest, groan in our hearts, waiting for that adoption which is the ransoming of our bodies from their slavery." That transformation of our material bodies to which we look forward one day has been accomplished—we know it now for certain-in her. When the Son of God came to earth, he came to turn our hearts away from earth, Godwards. And as the traveller, shading his eyes while he contemplates some long vista of scenery, searches about for a human figure that will give him the scale of those distant surroundings, so we, with dazzled eyes looking Godwards, identify and welcome one purely human figure close to his throne. One ship has rounded the headland, one destiny is achieved, one human perfection exists. And as we watch it, we see God clearer, see God greater, through this masterpiece of his dealings with mankind. Monsignor Ronald Knox (1888-1957) was the son of the Anglican Bishop of Manchester and it appeared that he, being both spiritually perceptive and intellectually gifted, would also have a successful life as an Anglican prelate. 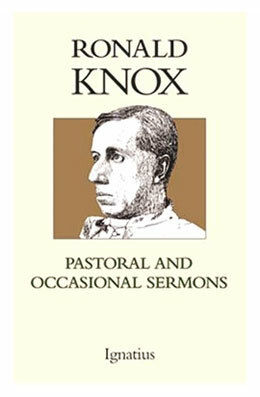 But while in school in the early 1900s Knox began a long struggle between his love for the Church of England and his growing attraction to the Catholic Church. He converted to Catholicism at the age of twenty-nine, became a priest, and wrote numerous books on spiritual and literary topics, including The Belief of Catholics, Captive Flames: On Selected Saints and Christian Heroes, The Hidden Stream: The Mysteries of the Christian Faith, Pastoral and Occasional Sermons, and many more. Visit Knox's IgnatiusInsight.com author page for more information about his life and work. Detail of "The Sacred Heart of Jesus" by Salvador Dali (1962). The Readings for Sunday, August 14th show that Jesus causes division and brings unity for one and the same reason: He is both the scandal that divides and the Savior who unites. Predictably, many media outlets sensationalized the contents of the document and ran headlines such as “Vatican hits ‘wounded’ Christian churches,” as though the teaching “that the Church of Christ subsists in the Catholic Church” is somehow new to the Vatican, the pope, or Catholicism. Of course, it isn’t. Yet that didn’t keep some Catholics from expressing their outrage at the supposed “intolerance” coming from a backwards and “polarizing” Pope Benedict XVI. That letter writer would do well to read both the document he wrongly criticizedand today’s Gospel reading, which describes Jesus explaining that He has “come to set the earth on fire, and how I wish it were already blazing!” This is a reference back to the third chapter of Luke’s Gospel and John the Baptist’s explanation that the Messiah “will baptize you with the Holy Spirit and fire” and that He will burn the chaff “with unquenchable fire” (Lk 3:16-17). Like the prophet Elijah, who called down fire from heaven to consume his enemies (2 Kgs 1:10-14), the presence of Jesus often caused violence and disturbance—not because He opposed love and peace, but because the destruction of evil and sin demanded a violent, active love. Only through bloodshed and sacrifice will peace be fully established, and then only at the end of time. Many theologians and authors have tried in recent decades to warp the Gospels and remake Jesus into a sort of mild-mannered self-help guru who never uttered a disturbing word or made a shocking comment. Yet Jesus stated that He would bring division, even among families, setting parents against children. This is painful to consider, but it has often been the case: sometimes the one who enters the family of God must turn his back on father, mother, and siblings. To take up modern terminology, Jesus came to apply shock therapy to the ailing hearts and souls of those lost in sin. The fire that He gave—and continues to give through His Church and the sacraments—is the burning life and the transforming energy of the Holy Spirit, which consumes what is weak and wanting while purifying and enlightening the minds of those who follow Him. “As fire transforms into itself everything it touches,” remarks the Catechism, “so the Holy Spirit transforms into the divine life whatever is subjected to his power” (CCC 1127; cf. 696). That transformation is ultimately an all-or-nothing reality; there is, in fact, a “believe-what-we-say-or-leave” aspect to Catholicism, although it is far better expressed as “believe-what-He-says-or-leave”. Jesus causes division and brings unity for one and the same reason: He is both the scandal that divides and the Savior who unites. The bloody Cross is the scarlet line that separates and a steady tie that binds. As the Letter to the Hebrews states today, the Cross is shameful to many. But for those who have their eyes fixed on Jesus, the Cross is the ladder to joy and life. The theologian Fr. Hans Urs von Balthasar, in reflecting on martyrdom and the cost of discipleship, once wrote that the “only valid response” to the death of Christ on the Cross “is to be prepared to die for him, and even more, to be dead in him.” Through that death comes real peace; in that death we experience true and abiding love. Yes, indeed, let us start acting more like Jesus! There was one truly remarkable part of the WYD celebrations that did not receive as much attention as these other details, yet it was revolutionary. I am speaking about the music used at the major English-speaking catechesis sessions. This year, the main English-speaking catechesis was held at Tauron Arena, renamed “Mercy Centre” for the week. Each day, roughly 15,000 pilgrims packed the arena to hear keynote talks by Cardinal Seán O’Malley, Cardinal Tagle, and Cardinal Dolan. At the conclusion of the morning session, Mass was celebrated in the arena. Nothing is new about the general structure of the catechesis I have just described. The revolutionary part was the music used at the Masses in Tauron Arena. Typically, these Masses feature pop concert-style praise & worship led by an on-stage band. This year, however, the preparations for these large-scale liturgies were entrusted to the Dominican Liturgical Centre in Kraków. Fr. Lukasz Misko, OP was invited to serve as Director of Music for the English-language liturgies, and he, in turn, invited fellow-blogger Christopher Mueller to serve as conductor for all of these liturgies (as he announced here). The result was an experience very different from the norm. Notably, not a single hymn was sung during Mass. Praise & worship songs were used throughout the day at the arena, before and after Mass, but no garden variety metrical hymns or songs were sung during Mass, from the Sign of the Cross to the Final Blessing. This, in itself, is revolutionary. These English-language liturgies are the fruit of a long and ongoing collaboration between Dominican Friars in Poland and their Dominican brethren in the United States. And one of the first impressions you may have is, a lot of this music is unfamiliar. What we hope you’ll take away from these Masses, though—alongside the presence of Christ in the Eucharist and the camaraderie of thousands of new Catholic friends from around the globe—is a sense of how beautiful the music of the Mass can be. And it’s all about God, and He’s a Mystery. The unfamiliarity of this beautiful choral music gives us a chance to experience God anew at each liturgy. We can’t apply our usual “traditional music = conservative” or “contemporary music = liberal” thinking. We must become open to the vastness of God, and beauty offers us a powerful means of doing that; true beauty calls us out of ourselves, orients us to something greater, and stirs up a longing for the transcendent. Sacred music, the expression of the deepest human yearning for the most profound Mystery of Love, creates in us a special dimension whereby we can be permeated and transformed by the Eternal beauty of God, Himself. Do read Fr. Friel's entire post. Your days should be numbered! SAN FRANCISCO, August 9, 2016 – Chene Heady was a devout Catholic whose daily concerns were shaped primarily by forces other than his faith: career demands as a college professor, financial decisions, scheduling conflicts, etc. He worked long hours, and had limited regular interaction with his wife, also a busy professional, and young daughter. He was the typical overextended and anonymous modern Catholic man — until he tried a fascinating experiment that drastically rearranged his life, which he chronicles in his encouragingly honest memoir, NUMBERING MY DAYS: How the Liturgical Calendar Rearranged My Life. After reading about the importance of the Catholic Church’s liturgical year, Heady decided to take on the challenge of living as though the Church’s calendar, not the secular one, stood as the center of his life. He observed the Church’s seasons and feasts, and meditated on its daily readings, every day for a year. It was an immensely rewarding decision, as Heady found that his life, and his relationships, including with his wife and daughter, became more meaningful and fruitful. One of the myriad ailments afflicting the modern world is the loss of the sense of the sacredness of time, a deafness to the rhythms that accentuate a truly Catholic life. Heady provides the antidote in NUMBERING MY DAYS, and describes how the liturgy is our universal story and alters our imperfect existence, even when we believe we’re stretched thin and feel as though our lives are devoid of meaning. For more information, to request a review copy or to schedule an interview with Chene Heady, please contact Kevin Wandra (404-788-1276 or KWandra@CarmelCommunications.com) of Carmel Communications. "'After the Natural Law' is a brilliant lesson in intellectual history, but it is also much more." We live and move and have our being today in what we might call the aftermath of the natural law. We have become once again culture-bound, and our culture denies the pervasive evidence for the natural law in favor of philosophies which serve particular passions, mostly having to do with a flight from God, the pursuit of power and wealth, and the unquenchable desire for utopia, by which we mean a world made in our own image. How has this come about? How was such a great synthesis, forged over nearly two thousand years of brilliant thought and insight, torn apart over the next seven hundred years, leaving us with essentially nothing? The question is pertinent, for the “nothing” that we have now inherited looks surprisingly like the nothings that were being proposed in ancient Greece before the great Western philosophical tradition began to develop. Talk about going back to the future! If we go back far enough we arrive at where we are today, imagining the twin deceptions of “no matter and never mind”. Either everything is materialistically determined (never mind) or everything is whatever we project it to be based on our desires (no matter). Given the intellectual achievements of our past history, it is astonishing that in the twenty-first century we have no greater grip on reality than had the Greeks before Socrates! (And no greater than the pagans before Christ.) Perhaps it is time to freshly examine how Western civilization escaped despair and futility in the first place, and to reconsider what went wrong. Fortunately, we now have a clear and readable book which does exactly this, exploring the rise and decline of the quintessentially Western understanding of reality beginning in the sixth century before Christ. In some 275 luminous pages, John Lawrence Hill of the Indiana University School of Law connects all the dots with such clarity of thought and expression that the subject matter, which readers might otherwise find confusing, is always deeply engaging. The book was published this year by Ignatius Press. Its title is After the Natural Law: How the Classical Worldview Supports Our Modern Moral and Political Values. Hill gives us not only Plato, Aristotle, Augustine, Aquinas and the other great contributors to the Western synthesis, but also William of Ockham, Descartes, Locke, Hobbes, Mill, Kant and others who largely dismantled it, without solving the problems it had so successfully addressed. The story is riveting because it explores the fundamentals of human existence—the very fundamentals we are so desperate to grasp today. Can we know reality? If so, is there such a thing as truth? Do we have a purpose? If so, are we capable of choosing our ends and means in any meaningful way? Are we free merely for nothingness? Or are we free at all? But no matter how many factors one identifies, the progress of civilization remains a mystery. A full understanding of the ebb and flow of the human grasp of truth, including religious faith, remains hidden in the workings of Divine Providence. This makes it even more helpful to focus on the path followed by the ideas characteristic of the Western synthesis, the better to grasp how we should start thinking about things now. Again, it is precisely this story of rise and fall—of construction and deconstruction—that Hill tells with such admirable clarity. Even better, what we see in this account is that hope is not lost. Quite the contrary. Not only does Hill enlighten in a wholly positive and encouraging way, but he also knows that those who have pronounced the Natural Law dead have made a premature diagnosis. In fact, quite a number of scholars have been quietly at work on a significant reconstruction for the past fifty years. It is true that the loss of meaning that characterizes Western intellectual life today is still pervasive, but there is rapidly growing energy on the other side—even as those who have abandoned meaning drift slowly into irrelevance. I do not know the future, but I think it can be glimpsed in this welcome and even remarkable book. After the Natural Law is a brilliant lesson in intellectual history, but it is also much more. It is a vision of meaning, and a marking of the path that leads to it. This volume in the popular Bible study series leads readers through a penetrating study of the Books of 1 & 2 Samuel using the biblical text itself and the Church's own guidelines for understanding the Bible. Ample notes accompany each page, providing fresh insights by renowned Bible teachers Scott Hahn and Curtis Mitch, as well as time-tested interpretations from the Fathers of the Church. They provide rich historical, cultural, geographical or theological information pertinent to the Old Testament book - information that bridges the distance between the biblical world and our own. It also includes Topical Essays, Word Studies and Charts. The Topical Essays explore the major themes of 1 & 2 Samuel, often relating them to the teachings of the Church. The Word Studies explain the background to important Bible terms, while the Charts summarize crucial biblical information "at a glance". Curtis Mitch, a former student of Scott Hahn, is the General Editor of the complete Ignatius Study Bible series. Scott Hahn, Ph.D., well- known as the author of several best-selling books including Rome Sweet Home and The Lamb's Supper, is a professor of scripture at the Franciscan University of Steubenville, and a very popular scripture scholar and speaker. "With copious historical and theological notes, incisive commentary and tools for study, the Ignatius Catholic Study Bible is outstanding for private devotion, personal study and Bible study groups. It is excellent for evangelization and apologetics as well!" "The Ignatius Study Bible is a triumph of both piety and scholarship, in the best Catholic tradition: simply the most useful succinct commentary that any Christian or other interested person could hope for." Russell Shaw is one of the best Catholic writers and historians in the Catholic world. In his new book, Catholics in America, he offers the reader the opportunity to go from the very beginnings of Catholicism in the United States up to our own times, through a series of 15 portraits of important American Catholics. He describes these major Catholic players, the influence that they had, their understanding of the congeniality or uncongeniality of the American project to Catholicism, and the difference they made — for better or worse — in the Church in the United States today. He then takes a look at how the situation of the Church in America may look in the future. This book will greatly aid those who are history-challenged in general and Catholic students in particular. It could also help in evangelizing relatives and friends interested in venturing deeper into the truth of Catholicism and its impact in this country. My own doctorate is in history, and I recommend this book strongly. Read the entire review on the Register's website. This is a collection of short, popularly written profiles of some of the leading figures in American Catholic history. The group includes Archbishop John Carroll, St. Elizabeth Ann Seton, Orestes Brownson, Isaac Hecker, Cardinal James Gibbons, Al Smith, Dorothy Day, Cardinal Francis Spellman, John F. Kennedy, and others. Collectively, their story is the story of the building and shaping of the largest religious body in the United States. But it is also something more. Catholics in America reflects the ongoing, often controversial, effort to work out the Catholic identity for American Catholics in the context of sometimes hostile, sometimes all-too-inviting American secular society. The book poses a fundamental challenge to the conventional wisdom of Catholic Americanist historiography which takes cultural assimilation for granted. The oldest question in the history of the Catholic Church in the United States may be this: "Is it possible to be a good Catholic and a good American?" Catholics in America documents the variety of answers that have been given to date, and why the question is more timely now than it has ever been before. History, human interest, and the drama of faith lived out in action come together in these portraits to tell an exciting story that stretches back two hundred years and continues today. "Intelligence, zeal, fidelity and a sharp critical eye: Russell Shaw excels in each of these qualities. All of his skills combine here. His portraits of 15 key Catholics from our nation's history make for a compelling experience of the tensions that exist between our Christian identity and the powerful appeal of American secular culture. This is a small book with big content. It's offers wonderful help, vividly readable and wise, in understanding the dilemmas and paradoxes of the Catholic Church in the United States." "Russell Shaw's fifteen great Americans brings into poignant relief the changes in the American society into which it was once thought possible and desirable for Catholics to join as fully pledged citizens. We have here a sober book that allows us, belatedly, to examine our political souls in the light of more eternal things." Detail from "Christ Leading the Apostles to Mount Tabor" by Lorenzo Lotto (1512). “What is the mark of a Christian?” asked St. Basil in his work, Moralia, which is a guide living a morally upright life in the world. How might we answer this question? To be kind. To be charitable. To give to the poor. These are all good answers, but St. Basil’s answer emphasized something else: “It is to watch daily and hourly and to stand prepared in that state of total responsiveness pleasing to God, knowing that the Lord will come at an hour that he does not expect.” A true Christian is vigilant, meaning he is ready to hear God’s word and to respond accordingly. Today’s readings are about vigilance, especially as they relate to the virtues of faith and hope. In fact, vigilance is really impossible with faith and hope, for the disciple of Christ stands prepared because he believes in faith that the Lord has come and will come, and because he believes in hope that Christ will fulfill the promises granted through the new covenant, the Church, and the sacraments. The Book of Wisdom was written by a well-educated, anonymous Jewish author living around Alexandria, Egypt, between 180 and 50 B.C. The “night of the Passover” was, of course, a definitive moment for the Israelites. “It was a night of watching by the LORD, to bring them out of the land of Egypt” (Ex. 12:42). The vigilance kept on the night of Passover was based on the promise and the “knowledge of the oaths in which they put their faith,” which had been given to them by God through Moses. This vigilance was not just a matter of waiting and watching, however, for it also involved the sacrifice of an unblemished lamb. The blood of the lamb was to be put on the doorposts as a sign of their faith, and then the lamb was to be eaten (Ex. 12:3-14). This led, then, to two essential acts: the liberation of the people and the destruction of their enemies. Hebrews 11 is a powerful, even poetic, celebration of vigilant, active faith. It opens by stating that faith “is the realization of what is hoped for and evidence of things no seen.” Faith is rooted in God’s actions and words in the past and looks with hope toward the future and “a better homeland, a heavenly one” (Heb. 11:16). Abraham, filled with faith, obeyed when he was called to go to the promised land. Vigilant, he responded, even though he was not certain of where God was leading him, but believing that God had a prepared a city for him. That city is heaven, the new Jerusalem, the dwelling place of God. There is but one holy land, and it was inaugurated by Jesus Christ, who is the new Moses, “the pioneer and perfecter of our faith” (Heb. 12:2). He inaugurated the kingdom through preaching and teaching, and by establishing the Church, the “little flock” referred to in today’s Gospel. “The Word of the Lord,” states Lumen Gentium, “is compared to a seed which is sown in a field; those who hear the Word with faith and become part of the little flock of Christ, have received the Kingdom itself” (par. 5). Our prayer should echo that uttered by Blessed Elizabeth of the Trinity, that we will be “completely vigilant in my faith, entirely adoring, and wholly given over to your creative action” (CCC 260).